Structural airtight OSB3 panel with integrated vapour control and air barrier properties for use as structural sheathing in timber frame structures. 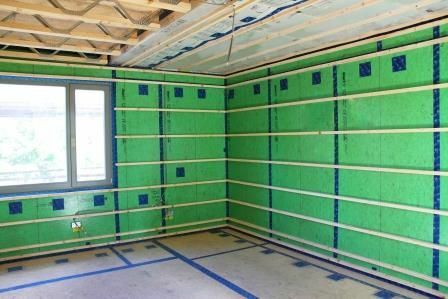 Airtightness is engineered into the OSB panel substrate, whilst SMARTPLY's in-house speciality surfacing technology provides an integrated vapour barrier with consistently high vapour resistance over the entire surface. The coating also provides a smooth durable surface for superior bonding of airtight tape at panel joints. SMARTPLY PROPASSIV provides a sustainable and robust alternative to specialist AVCL membranes which are prone to damage by site trades during the construction process. The product is suitable for both new build and renovation projects. Airtightness engineered into OSB substrate with specialist surfacing technology providing integrated vapour barrier and ideal surface for adhesion of tapes on the joints. Easy to cut and fix. Rigid panel - less susceptible to damage than membranes. Manufactured from FSC® timber from MEDITE SMARTPLY's own forests-assured supply of sustainable raw material. Moisture content (to BS EN 322): 4–9%. Release of formaldehyde (to BS EN 13986): Class E1. Thermal conductivity (to BS EN 13986): 0.1 W/m·K. Water vapour diffusion factor (μ) (to BS EN 12572): Dry cup: 750 (±80); Wet cup: 420 (±40). Equivalent air layer thickness (sd) (to BS EN 12572): Dry cup: 9.4 m (±1.0); Wet cup: 5.2 m (±1.0). Air permeability: <0.001 m³/m²/h/Pa (at 50 Pa). Air permeability coefficient at 50 Pa (tested to EN 12114): < 0.005 m³/(h.m²).